In the "I couldn't have said it better myself" category, this week's MM has been written by Tina Creguer, staff member of the Public Team at Gale Cengage Learning<http://www.cengage.com/search/showresults.do?N=197> who contributes content to The Blog<http://blog.gale.com/>. Thank you Tina and Gale for sharing this useful reminder. Pop quiz. Are these organizations real or made up? 1904 World's Fair Association, Medieval Academy of America, National Clogging Organization, National Space Club, and American Association of Independent Music (A2IM). Answer: all five are real, thriving organizations - and someone in your community may benefit from connecting with them. The resource that many rely on to pinpoint valuable information for more than 24,000 associations, both national and multi-national, is the venerable Encyclopedia of Associations. This foundational reference work features updated content, is searchable, and is available online through MeL Database Gale Directory Library.<http://www.galesupport.com/migeoipcheck/migeoipcheck-gale.php?database=GDL>  Information includes ... contact information, founding date, purpose, activities, dues, conferences, and much more. It's the most comprehensive collection of U.S.-based national nonprofit membership associations and other organizations in the world with entries verified and updated each year to ensure completeness and reliability. With Gale Directory Library<http://www.galesupport.com/migeoipcheck/migeoipcheck-gale.php?database=GDL>, you can make information accessible digitally anytime, anywhere. Help your patrons connect with causes, organizations, and ideals that matter to them. Michigan residents or Michigan library access only. MeL Minutes are brought to you by the Library of Michigan. Want more information on MeL? Stay tuned for next week's MeL Minute available on many Michigan library listservs, email us at contact at mel.org<mailto:contact at mel.org> or visit mel.org<http://mel.org/>. We encourage you to share MeL Minutes with your public service colleagues. Registration is open for the next MCLS MeL Databases training webinar. Over a quarter million Michigan residents speak Spanish. MeL is there to help serve their information needs. Join us on February 24, at 9:30 am, for a brief, half hour free webinar focused on MeL resources for Spanish speakers<http://mcls.org/training-events/training-events-list/training-event/?ref_cID=198&bID=0&dd_asId=3344>. 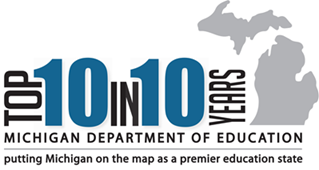 Our collective efforts can help make Michigan a Top 10 education state in 10 years!